Imagination Station is fantastic FREE family fun – indoors! 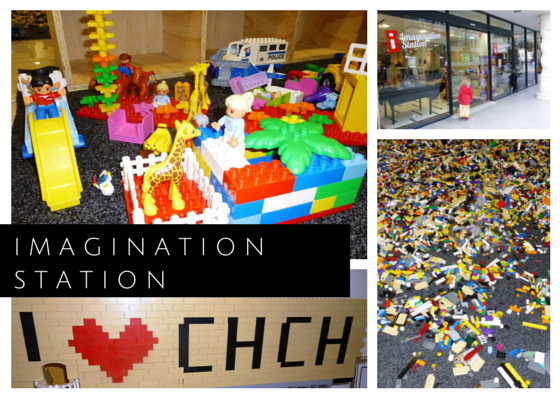 Located inside Cathedral Junction, there is loads of lego and plenty of iMacs – you just have to bring your own imagination. There are two areas of lego: regular and duplo, to suit different ages. Watch out for competitive parents pinching the best pieces! There is plenty of seating and you’re allowed to bring in your own food and drinks. There are several cafes nearby and you can even text coffee and cookie orders to Mrs Higgins. Open daily 10 am – 6 pm. Imagination Station is run by a charity and while everything is free, they really appreciate donations. We visited Imagination Station in August 2015 (winter). Imagination Station – check out the birthday party info (just $5 per child).